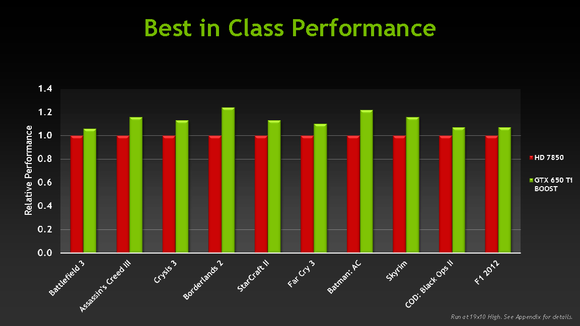 Nvidia today fired the next salvo in the GPU arms race: The GeForce GTX 650 Ti Boost. Nvidia and arch-rival AMD have decided that 30 frames per second at 1080p resolution is the gaming sweet spot, and so the GPU designers have set about beating each other over the head to build the best chips for delivering that performance at a $150 price point. While both companies happily oblige gamers craving higher performance-those with the financial means to satiate their hunger, that is-it's the mainstream products that generate the most cabbage. And they're certainly justified in designating 1080p a "mainstream resolution," since that's the spec most consumer-oriented 23- and 24-inch displays deliver. To that end, Nvidia is looking to chop the legs out from under AMD, which announced its own "1080p sweet spot" offering- the Radeon HD 7790 -just last week. AMD set a price target of $150 for Radeon HD 7790 cards in order to compete with boards based on Nvidia's GeForce GTX 650 Ti, which until then had been the sole occupants of that price bracket. The price of cards based on Nvidia's new GeForce GTX 650 Ti Boost GPU will start at $149. AMD maintains that its 7790 is on average 20 percent faster than Nvidia's original 650 Ti. But Nvidia announced that existing GeForce GTX 650 Ti cards with 1GB of memory will now sell for just $129. The new and faster GeForce GTX 650 Ti Boost-which Nvidia claims is on average 40 percent faster than the original 650 Ti, and 10- to 20-percent faster than AMD's pricier Radeon HD 7850-will sell for $149. But there's a slight catch: The 1GB 650 Ti Boost cards won't begin shipping until early April. The models Nvidia says consumers can buy today come with 2GB of memory and cost $169. 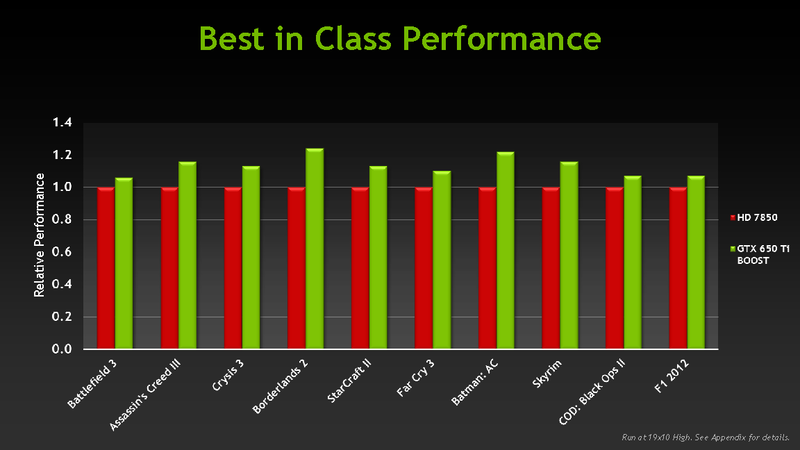 Nvidia claims the GeForce GTX 650 Ti Boost is on average 10- to 20-percent faster than AMD's Radeon HD 7850. Nvidia also took the opportunity to counter an AMD talking point: all GeForce 650 Ti Boost cards will operate in two-way SLI, where the original 650 Ti cannot (a pair of AMD Radeon HD 7790 cards, it should be noted, can operate in two-way CrossFire mode). The GeForce GTX 650 Ti Boost is outfitted with 768 CUDA cores and runs at a base clock rate of 980 MHz. When the workload demands it, that clock rate is automatically boosted up to a top speed of 1033 MHz. The cards have a 192-bit memory interface to deliver memory speed of 6 gigabytes per second. Each card draws power from a single six-pin power connector (in addition to drawing power from the PCIe 3.0 bus). Cards based on this GPU will typically have dual DVI, DisplayPort 1.2, and HDMI on their mounting brackets, although third-party manufacturers are free to offer different designs (VGA, for instance). Cards following Nvidia's reference design will be outfitted with dual DVI, HDMI, and DisplayPort on the mounting bracket. Third-party manufacturers will also offer overclocked cards at higher price points. EVGA, for example, today announced two products: A stock-clocked version that will sell for $169, and the $179 GeForce GTX Ti Boost Superclocked model, which will offer a base clock of 1072MHz and a boost clock of 1137MHz. Both models will be outfitted with 2GB of GDDR5 memory. EVGA will offer two models based on the EVGA GeForce GTX 650Ti Boost, with the Superclocked version overclocked at the factory.